Blog - Reasons why I adore my duffle bag and why you should own one too!!! Duffle bags are one of the best multi utility bags as it can easily double up as a Gym bag to travelling bag to a sports bag. The very reason, I am head over heels for these duffle bags is the ease with which it can be carried anywhere keeping in mind its elongated shape which acts as a storage powerhouse. With a long zipper that allows the bag to open all the way up, it gets easier to pack and find things inside while the shape allows it to be roomy without being too heavy like other accessorized bags. Another strong reason for my mad love for these duffle bags is despite being unisex; the bags are fashionably trendy. It’s cool to carry it in my college, fun trips and is sooooo convenient while travelling. Now, The House of Tara, has taken duffle bag styling to a whole new level, accessorizing with different forms of printing on canvases like patch print work to their retro broken Star and compass logo creating an attractive but differentiated bag. They have an amazing range that suits everyone’s preference, but I fell for their diverse range of rugged duffle bags made in canvases which includes their best seller in handcrafted duffle/gym bag in premium wax coated canvas with genuine leather detailing. The stuff just always looks smart with the contrast leather trims. What I love about these rugged bags is that despite carrying heavy metallic hardware and leather detailing; they are low on maintenance. I often ride bikes and I go out riding every weekend with my The House of Tara duffle bag. It fits all my riding gear along with water bottle etc. and when I’m not riding, I use it as my primary travel bag. These bags are quite spacious while still being within the specified hand luggage guidelines of airlines. Plus, the fact that there are two small, outside zipped pocket which are perfect for accommodating passport, phone and keys. From a design perspective, use of antique metallic zipper and other heavy duty metallic hardware like rivets, base studs; enhances the bag aesthetically and also adds strength to the bag. The bag is lined with a durable polyester lining with a zip pocket for securing your mobile etc and also waterproofing the bag. If a rugged or distress finish look to a bag does not attract you; then one can also explore The House of Tara’s colourful large weekend special bag, made of beautiful kantha embroidered fabric, or attractive handwoven fabric. The intricate thread work detailing on these bags are done by hand. This versatility and availability of duffle bag options in various shapes, using different material and prints makes it a major reason to like and use them in day to day life. 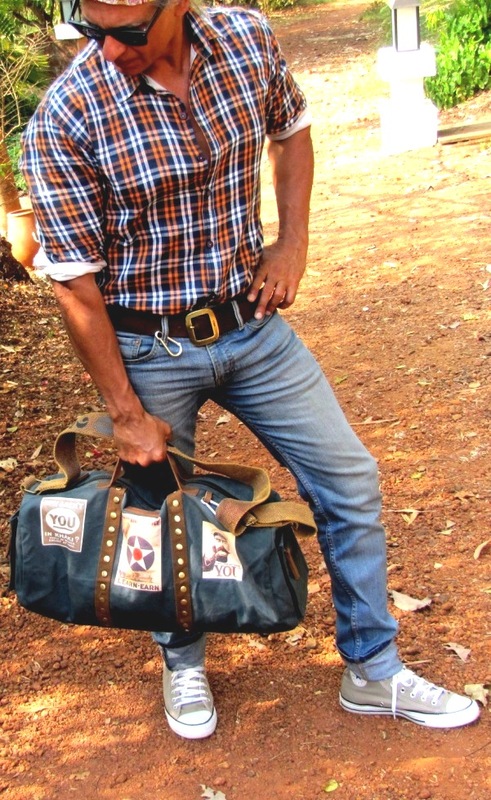 If you are a fitness buff, then you can opt for waterproof wax canvas duffle, if a frequent traveller then the rugged distressed canvas is apt while if you like delicate intricate handwork then kantha and handwoven fabric duffles are a must. They all come in different colours and prints. In all the main compartment is very voluminous with a two-way zip closure. The bag design is further enhanced with attractive printed cotton or polyester lining with a zip pocket. Padded shoulder straps are used for ease of carrying during long journeys. I am sure you agree with most of the facts mentioned above about duffle bags which makes it pretty evident of duffle’s being the favourite travel accessory in my wardrobe. Lastly and most importantly the quality assurance I get from my most trusted brand- The House of Tara. It’s this quality centric value for money product that reinforces the brand’s unique identity and signature. So, give it a try and let us know, what you liked most about their unique collection of duffle bags. You can check the entire range on the website, www.thehouseoftara.co.in which remains the best online portal for bags across categories. There are exclusive discounts awaiting to be capitalised on. So, hurry and shop on www.thehouseoftara.co.in.